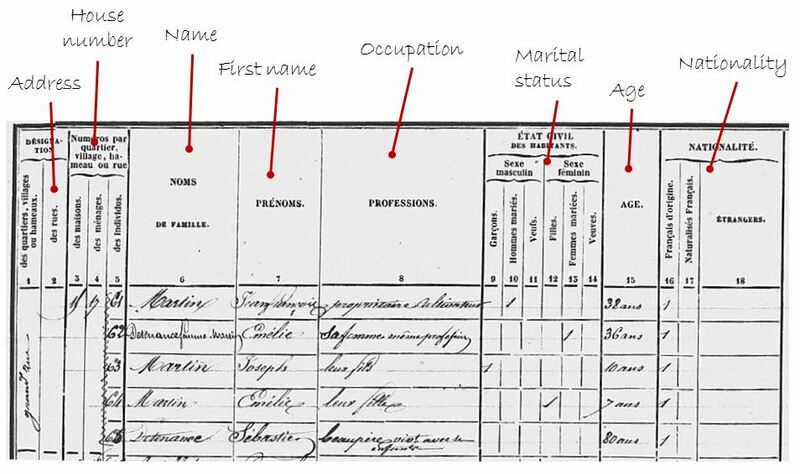 French census records (“recensements” in French) are a great resource if you want to know more about the living conditions of your French ancestors: how many children they had, what other family members they lived with, where their house was located… And also about their occupations and employers. The first population censuses in France were conducted in 1791. However, it is rare to find census records from that period. For most towns, census records start in 1826 or 1831.
the 1916 and 1941 censuses were cancelled due to the First and Second World War. Some census records also give: the nationality, the place of birth, the type of employment (boss, employee, …) and the name of the employer. Census records can be found in the Archives Départementales of each departement. Most of these records have been digitized and they can be found online on the Archives Départementales websites. And thanks to a change of law in december of 2018, census records of many French departements are now available online until 1936. Tip: You can find the Archives Départementales websites by googling “archives départementales” + the name of the département where your ancestors lived. Census records can be found under differents names: “recensements”, “recensements de la population” or sometimes “dénombrements de la population” or “listes nominatives du recensement”. Unfortunately, census records have rarely been indexed. So, you will have to read all the pages in order to find your ancestors. For small villages, this is not really a problem. But for big cities, it’s better to know the street where your ancestors lived before searching in the census records. This is an information that can often be found on birth, marriage or death records. some census records from 1901 to 1911. 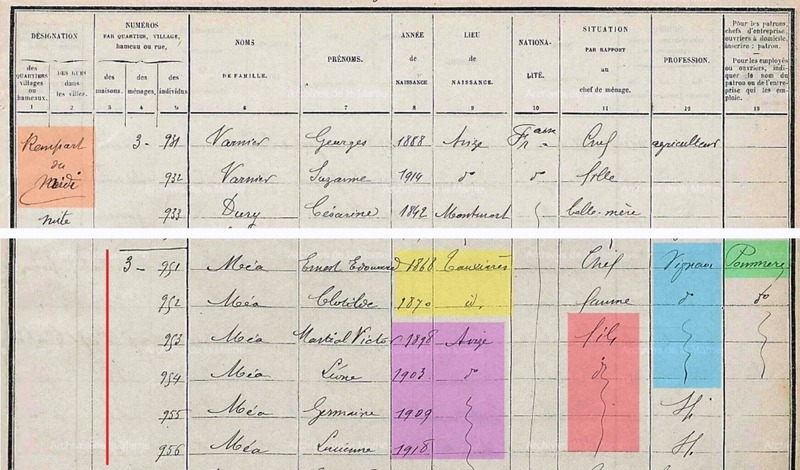 Here is an example of what I could learn about one of my ancestors’ family, thanks to the 1921 census records. In 1921, the Méa family lived on the “Rempart du Midi” *** street in Avize (Marne). The family was composed of: Ernest Edouard MEA, his wife Clotilde and their 4 children ***. Note: instead of repeating the same word on following lines, the census taker often wrote the abbreviation d° (for ditto) or a sort of wavy line. Here, the first child is marked as fils, and the line is used to indicate that the following persons are also the children of the head of household. Both the husband and the wife were born in Tauxières (Marne) in 1868 and 1870 ***. And their four children were born in Avize, between 1898 and 1918 ***. We also learn that all of them worked as wine-growers (vigneron) ***, except for the two youngest daughters who were too young to be employed. The name of their employer is indicated in the last column: it was the famous Champagne house Pommery ***. Note: for people who didn’t have an occupation, the box will either be empty, or filled with sp or sans, meaning sans profession (“without occupation”). my father was born in Douai, Nord France but his father was english and mother was french and she passed away during his early years i was asking him about his family before he passed away and he had a serious fallout with his father as during ww2 he and his elder sister were left in france and brought up by his mums family can you please advice the best way to find out about my french side as my dad did not know his mothers maiden name thank you so much for this site im hoping it helps me in my future search. thank you for your message. The best way to start would be to obtain your father’s birth certificate in Douai. In France, the maiden name of the mother was always written on birth certificates. Birth certificates for Douai are online on the website for the Archives of the Nord departement until 1918. If he was born after that date, you can obtain his birth certificate by writing to the town’s city hall.